At present, Panaitolikos is in sixth place in Super League (Greece), while in Greece Cup (Greece) (group Gr. 3) they are in third place. Stunning 82% of Panaitolikos' football players are right footers and so is Admir Bajrovic. So far in the 2018/2019 season, Admir Bajrovic already competed in 38 fixtures. The Swedish forward Admir Bajrovic joined his current team, Panaitolikos (Greece), in January 2019. He is one year younger than than his team's average age, as he was born on 06.08.1995. Measuring 178cm, Panaitolikos'' average player height matches the one of Admir Bajrovic. At 158.73lb, he carries 2lb less than the average Panaitolikos player. His best season was Superettan 2017 (Sweden), because in this year he had his highest success in terms of both match presence and goals. To date, collectively Admir Bajrovic holds four penalties. Lately, he seems to be more quiet since less penalties were given to him than usually. After an overall look at his career, we can see that he was substituted in 48 times but never out. In the active season, he was taken out more often in contrast to 2017/2018 wherein the contrary happened. This season he scored twelve and assisted one goal which is 12.1% of all of Panaitolikos's goals in Super League 18/19 (Greece). On average, he initialized 0.03 and hit the net 0.32 times per match this season which is a better performance than last year's. Back then 0.3 goals and 0 assists per match have been achieved. Before joining Panaitolikos, Admir Bajrovic impressed at NEC Nijmegen, Ljungskille SK, Osters IF, Gefle IF and Follo. From his professional start until now, he has performed in 101 matches in total and hindermost appeared eleven days ago. On average, he has participated in 12.6 matches per season. 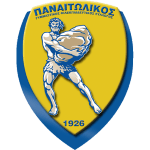 Panaitolikos has four more forwards in their squad, namely Nicolas Mana, Stathis Vasiloudis, Vlad Morar and Alhassan Kamara. So far this season, Admir Bajrovic lost 50% in Super League and tied 67% of Panaitolikos'' matches in Greece Cup. They also managed to win 2 fixtures in a row in Super League. Panaitolikos'' jersey number 9 is Admir Bajrovic. His record stay with a club is NEC Nijmegen (Netherlands) with two years and 6 months. Undefined days was the stubbiest period that he was contracted to a team (NEC Nijmegen from Netherlands).